Actor Micky Park Yoochun is showing the distinctive fashion sense, provoking the laughter of fans. On the afternoon of February 18th, 2012, Park Yoochun published a photo on Twitter. 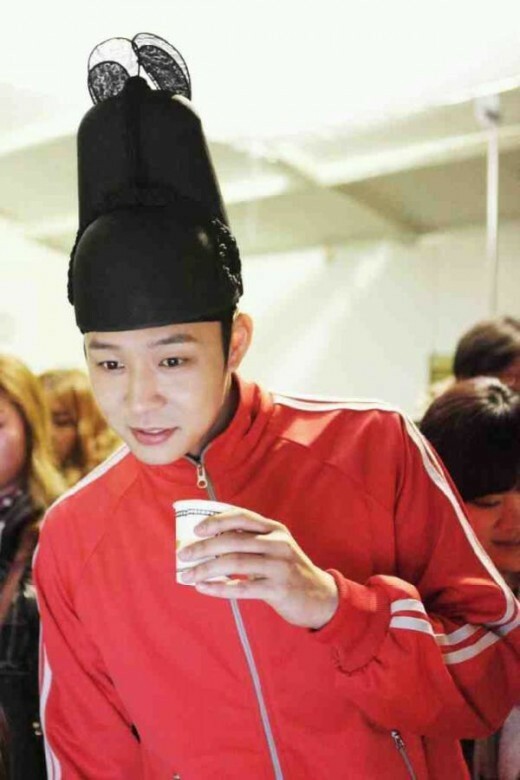 In the photo, Park Yoochun wore the ikseongwan (the hat wore by king when dealing with government affairs) on the head, dressed in red sportswear, gazed at somewhere. His hand was holding a paper cup, watching at something with great interest, looked at ease, attracting attention. Park Yoochun is currently shooting the SBS drama series Rooftop Prince, in the drama he is playing the role of crown prince who comes to modern era from Joseon Dynasty. Netizens who saw the photos commented, “The different feel of fashion sense by crown prince,” “Turn out he is a crown prince who loves coffee!” “Dressed in red sportswear also exudes texture of poster, really handsome!” and so on.